In a customer perspective, security is not an option. You can hear about cryptography, firewalling, etc. but no security will take place without the 2 main components of security : authentication and authorization. The former takes place for insuring that you are the person you pretend to be, the latter that you have the right to access a resource. 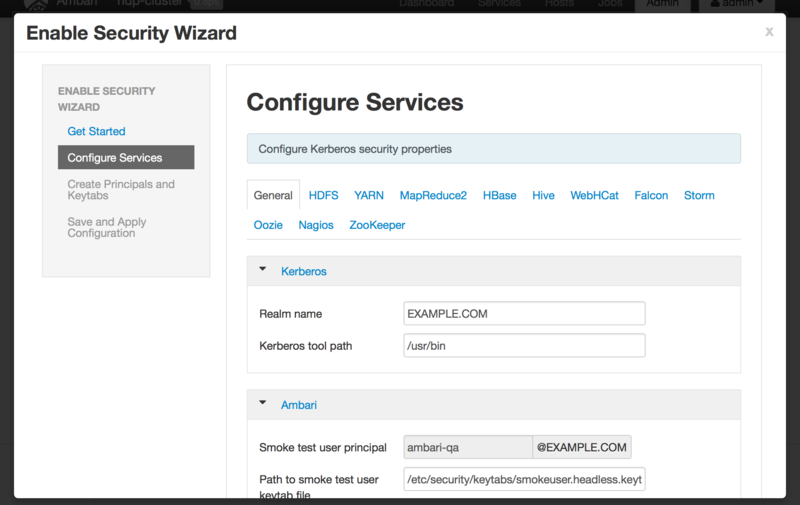 In this post we’ll talk about authentication, and the best and only existing way to implement that is Kerberos, a 30+ years protocol from MIT. – Client get his ticket and send his id with the ticket, sever checks the ticket validity and authorize the access. On my 3 machines (vagrant powered) cluster, first let’s install free-ipa server, which is a really great/simple/robust way to have Kerberos on your system. This cluster is under HDP 2.1.3 and Ambari 1.6.1. The ipa-server package (provided by RedHat) should be in your repos. Since my cluster is virtual machines with not “real” IP addresses and FQDN, I updated the /usr/lib/python2.6/site-packages/ipapython/ipautil.py to get rid of the IANA Ip address check. Click Next and provide the information requested. Basically, the only information you need to provide is the realm. Now Ambari proposes a smart way to generate all keytabs : download a CSV file that will be used with a script, which will take care of all that stuff. Download that CSV file and put it on your KDC machine. For using with IPA we have to make a slight modification into Hortonwork’s script : add the -x ipa-setup-override-restrictions parameter after the kadmin.local -q “addprinc -randkey $principal” command. Now let’s make all that keytabs. This will generate all keytabs in a tar archive we copy to each host. Please note the p option to preserve ownership, and sudo to make that option works. The –strip=1 is to avoid the ./ extraction which will make the current directory unbrowsable. Now we have all keytabs in /etc/security/keytabs directory. 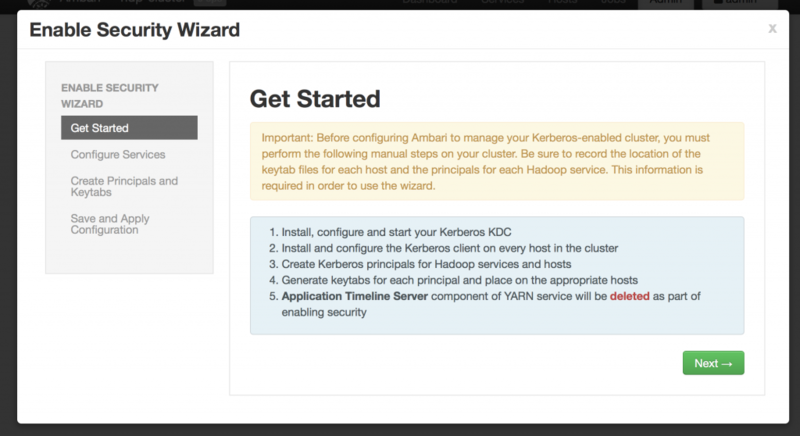 It’s now time to activate our kerberized cluster by clicking the Apply button in Ambari interface. Note : Generating a keytab will invalidate all that related keytabs on the realm ! As an example, if you re-run the generate_keytabs.sh script, this will ask new keytabs so you’ll got to copy it on all the servers. Note 2 : If you want to enable HA on your cluster, you’ll need new keytabs because of the new components. The easiest way is to redownload the csv and regenerate all the keytabs.